Spodumene is a greyish-white, green, or lilac pyroxene mineral consisting of lithium aluminium silicate in monoclinic crystalline form. It’s formula: LiAlSi 2O6. It is a lithium aluminum silicate mineral usually found in pegmatite veins. It is an important ore of lithium and is used in the manufacture of glass and ceramics and as a gemstone. The name Spodumene comes from the Greek, spodoumenos, meaning “burnt to ash” or “reduced to ash,” referring to the ashy color of early specimens or the grayish-white mass formed when the mineral is ignited. Spodumene is strongly pleochroic, shifting in colors depending on the angle of observation, and has a perfect cleavage and splintery fracture, making it difficult to facet. 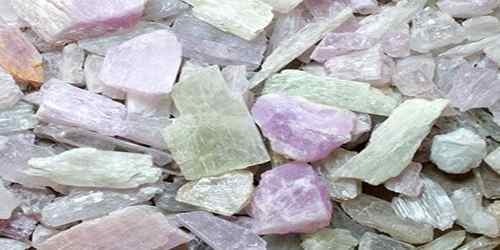 It forms in pink, violet, green, yellow, white, gray, colorless and brownish crystals. All forms fade in direct sunlight. Spodumene occurs in lithium-rich granite pegmatites and aplites. 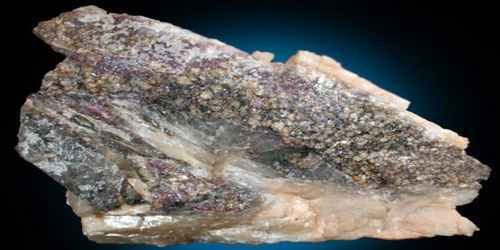 Associated minerals include: quartz, albite, petalite, eucryptite, lepidolite and beryl. It can grow into enormous crystals. The largest single crystal found is a well-crystallized, 42 foot (12.8 meter) giant. Even the transparent gem forms can come in huge gemmy water clear crystals so large that need to be held with both hands. 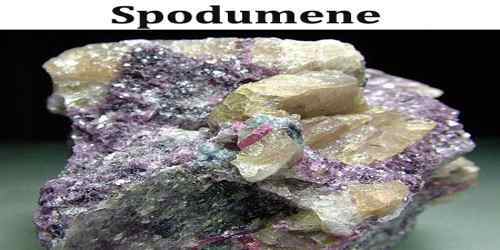 Spodumene is rarely seen on a matrix as it easily pops out of the host rocks. Because of their rarity, matrix specimens are highly sought after. 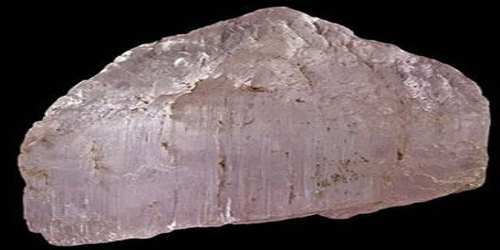 Kunzite – most popular variety, ranging in color from pale transparent pink to light violet. It is beautiful as a gemstone with a brilliant shift in color, and is a Stone of Emotion, pure in energy and joyful in nature. It opens and connects the heart to the mind and stimulates a healing communion between the two. Kunzite encourages one to release walls built around the heart for protection, and to be receptive to the experience of unconditional and abundant love. Hiddenite or Green Kunzite – varies in color from pale green, to yellow-green, to deep emerald green. Also known as Lithia Emerald, it is rarer than Kunzite and is sometimes faceted into gemstones. Hiddenite is a Crystal of Evolution, helping individuals to grow spiritually, and to be aware of their collective responsibility for the care of the Earth. It supports new beginnings and focusing on the present, relinquishing injustices of the past or anxieties for the future. Spodumene is an important source of lithium for use in ceramics, mobile phone and automotive batteries, medicine, Pyroceram and as a fluxing agent. Lithium is extracted from spodumene by fusing in acid; today most of the world’s lithium is produced from subsurface brines in Chile, Argentina, and China. These sources of lithium have lower production costs and are suitable for most uses. Spodumene sometimes occurs in transparent crystals in pastel shades of pink, green, and yellow. 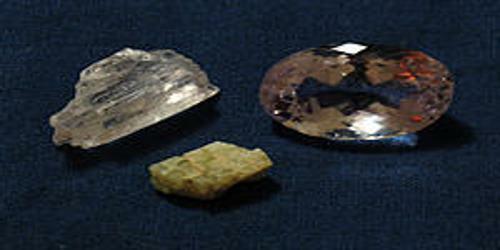 These have been cut into gemstones that are prized by collectors. However, their use in jewelry is limited to pieces that will be subject to limited abuse because of spodumene’s perfect cleavage. Yellow and clear specimens of spodumene have also been cut into gems; however, variety names for spodumene gems have only been given to Kunzite and Hiddenite.